Oh my gosh, Tanster! You MUST write a book about this whole OfficeTally experience! Thousands upon thousands of guaranteed sales! Jennie, I’m so glad you got that recognition! OfficeTally is, hands down, the best Office fansite. No contest. But also my favorite fansite ever. I found OfficeTally really early on (I even participated in OfficeTally’s header contest way back when) and it’s been THE Office resource ever since. You’ve done an amazing job keeping this site updated and getting the best behind-the-scenes content and such from everyone involved on the show. I think part of what makes The Office fandom so special is that the fans aren’t just focused on the great actors, but are really invested in ALL the work the crew does to make this show what it is. Thanks for everything you’ve contributed to the show all these years :) You’re the best! I was in Scranton for the Wrap Party and the best part of the day, hands down, was when Steve was announced. Just before he was introduced I was, literally, counting the seats and realized there was an extra. It was perfect. Everyone, simultaneously, jumped to their feet and the roar of the crowd left me with goosebumps. Perfect, perfect moment. I will always remember that. Thanks, Tanster for everything! Loved your questions at the panel! I wish you had been able to ask all of them! I am like crying watching these videos! Saturday was one of the best experiences of my life, hands down. Oh my God, I agree with Matty. HAHA. Seriously, thanks for the coverage. Truly appreciate it! It’s been a fun ride for sure. Much love to the OT crew, and signing off for what may be one of my last times ever. Spot on writing a book! There is a huge opportunity there – what Tanster has created is nothing short of amazing! Not to mention a great example of passion for an amazing show and selflessness and commitment to make OfficeTally truly a virtual destination. It’s been my go-to place for sure! This was the best experience of my life!!!! I can’t get over it. My only wish is that I could’ve gotten a picture with John or Steve. Also my 7 yr old daughter had her hand raised the whole time to ask Steve if he could do the voice of Gru lol. It’s our fav movie but she didn’t get picked and cried the whole 3 hrs home! =( It was still hands down the most awesome day in my life. Will the Wrap Party have a feature on the DVDs for the final season? I would love to see more of the event of the cast and Steve! BTW – I got a big smile on my face seeing Matt Collins’ and Jim Mosby’s comments on here! Ah, memories of the old chat room days! WOW!! Thanks for sharing my video!!! What a fun time that was!!! Still can’t believe that I got to do that with Rainn!! I just hate watching that end part though! I got so caught up in the moment and was just so shocked that I forgot some of the lyrics at the end!! Of course as soon as he walked away I remembered them. Figures. But this was definitely the best day of my life. Amazing, amazing event. 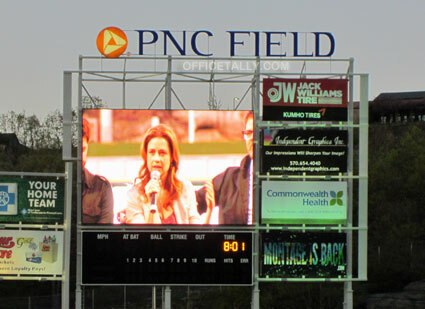 Tanster, I have plenty of great videos and photos from the PNC field event and the concert. I’ll be uploading my videos to http://www.youtube.com/user/MrScottsTot?feature=watch and tweeting them to you if you would like to share!! But I have a batch of really awesome photos from both events (I was front row for the concert) so what is the best way to send you those photos? E-mail? Twitter? Thank you for uploading all this, it’s great to relive everything! Thanks so much for adding all of my videos from the farewell celebration! Hope everyone enjoyed watching :) because it was absolutely amazing to be there! Thanks to the user with the full video! I asked the Scranton Strangler question and our camera died right before. THANK YOU!! !